The auditory pathway conveys the special sense of hearing. Information travels from the receptors in the organ of Corti of the inner ear (cochlear hair cells) to the central nervous system, carried by the vestibulocochlear nerve (CN VIII). This pathway ultimately reaches the primary auditory cortex for conscious perception. In addition, unconscious processing of auditory information occurs in parallel. 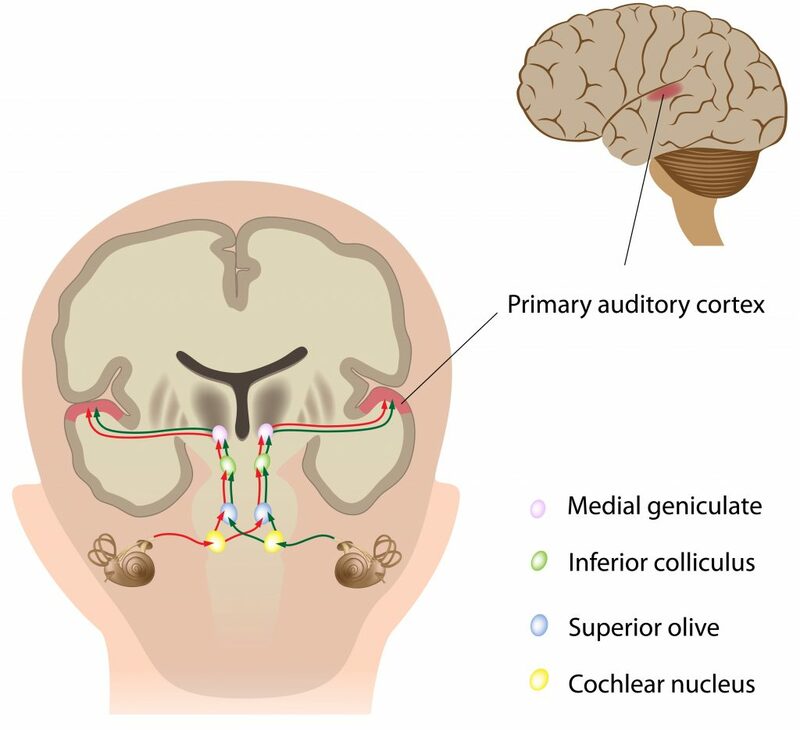 In this article, we will discuss the anatomy of the auditory pathway – its components, anatomical course and relevant anatomical landmarks. Fig 1 – Overview of the primary auditory pathway. The auditory pathway is complex in that divergence and convergence of information happens at different stages. Primary (lemniscal) pathway – this is the main pathway through which auditory information reaches the primary auditory cortex (A1). Non-lemniscal pathway – mediating unconscious perception such as attention, emotional response, and auditory reflexes. The spiral ganglion houses the cell bodies of the first order neurons (ganglion refers to a collection of cell bodies outside the central nervous system). These neurones receive information from hair cells in the Organ of Corti and travel within the osseous spiral lamina. Their central axons form the main component of the cochlear nerve. The vestibular nerve joins the cochlear nerve entering the internal acoustic meatus, and from this point onward they are collectively called vestibulocochlear nerve. This proximity is clinically relevant since lesions to this nerve will usually produce symptoms in both the auditory and vestibular components. The nerve enters the cranium through the internal acoustic meatus and travels a short distance (around 1 cm) to enter the brainstem at the cerebellopontine angle. For more information on the vestibulocochlear nerve, its anatomical course and function please read this article. The first order neurons synapse at the ipsilateral cochlear nuclei. Fig 2 – The spiral ganglion houses the cell bodies of the first order neurones in the auditory pathway. Ventral (anterior) cochlear nucleus – located in the area where the nerve enters the brainstem. Dorsal (posterior) cochlear nucleus – located posterior to the inferior cerebellar peduncle. It forms a small bulge on the surface of the brainstem – known as the auditory tubercle. From the dorsal cochlear nucleus, most fibers cross the midline and ascend in the contralateral lateral lemniscus. Other fibers ascend in the ipsilateral lateral lemniscus. From the ventral cochlear nucleus, some fibers also ascend in the lateral lemniscus bilaterally. However, most fibers from the ventral cochlear nucleus decussate to the contralateral superior olivary nuclei in a region known as the trapezoid body. Although the ventral cochlear nuclei neurons decussate at the trapezoid body, some fibers synapse at the ipsilateral superior olivary nucleus. The superior olivary nucleus is located just next to the trapezoid body. It also projects upwards through the lateral lemniscus. In summary, in both the dorsal and ventral nuclei, some fibers decussate while others don’t. For that reason, information from both ears travels bilaterally in each lateral lemniscus. This is important because supranuclear lesions (i.e. above the level of the cochlear nucleus) will not lead to serious hearing impairment. Therefore, hearing problems can be conductive or sensorineural but are rarely central. Fig 3 – Information from each cochlear nucleus is transmitted bilaterally. Fibers ascending through the lateral lemniscus from both cochlear nuclei and from the superior olivary nuclei arrive at the inferior colliculus, where all these fibers carrying auditory information converge. These fibers project to the ipsilateral medial geniculate body (MGB) in the thalamus (recall that vision is relayed on the lateral geniculate body). The MGB does not act as a simple relay centre: it has reciprocal connections with the auditory cortex and mediates refinement of the incoming information. Projections from the medial geniculate body proceed then to the primary auditory cortex. Note: A good way to remember what information passes through each geniculate body is that music goes to medial and light goes to lateral. The primary auditory cortex (A1) is located in the superior temporal gyrus, right under the lateral fissure. The primary auditory cortex is organized tonotopically, although its organisation is complex and the details are beyond the scope of this article. These are pathways that do not lead to primary auditory cortex. They involve multisensory integration, reflexes, attention and emotional responses. Which cranial nerve is most associated with the auditory pathway? What is NOT a function of the non-leminscal auditory pathway? In the primary auditory pathway, the first order neurones receive information from which structure?